In addition to our regional charity work with St Ann’s Hospice in Cheadle, we are really proud to work with other local charities, schools, community organisations and sports clubs every year through our relationship at a local level. Here at JP & Brimelow we donate our skills, time, money and local expertise to bring lasting benefits to all community activities in which we work. Kingsway Atheltic FC Training was formed to encourage girls of all ages to participate in football, gaining valuable experience and training in a fun and friendly atmosphere with enthusiastic professional coaches. JP & Brimelow are proud to sponsor this amazing club and have seen at first hand the development of girls football in South Manchester. If you have Girls that may be interested in taking part or trying out these sessions all are welcome! CHORLTON Golf Club professional Dave Mackinnon was a fine player and a stalwart for Lancashire golf in his amateur days with the highlights being matches against their Yorkshire counterparts. Please visit Dave down at his golf cave which is a bespoke in-door coaching room with all the modern technology for a private 1-2-1 lesson. One of the oldest Rugby Clubs in England established in 1882, just one year after the Lancashire County Rugby Union was founded and eleven years after the formation of the national Rugby Football Union. From its establishment in 1882 to location at its present facility at Hough End in Chorlton, South Manchester in 2004, the Club has used fourteen different grounds mainly in the Salford/Prestwich area but also in South Manchester. As their name suggests they have a large active cricket community at the club. They have 3 senior teams competing in the Manchester and District Cricket Association. The 1st and 2nd XI play league matches every Saturday through the season. The 3rd team complete on Sundays. Additionally they run junior sides for ages 10 to 19. Junior practice takes place on Mondays and match night varies according to age. They are working with Clubmark and Manchester City Council Cricket Development to improve junior cricket resources at the Club. They are always looking for new cricketers who will bring enthusiasm and commitment to the club. So if you want to get involved contact them directly. WITHINGTON GOLF CLUB, MANCHESTER. Set within the stunning Mersey Valley, with lush tree-lined fairways and responsive greens, Withington is widely regarded as one the finest 18 hole parkland golf courses in the Manchester and Cheshire area. Measuring some 6,388 yards, it offers a stern test to amateur and professional players alike. Visitors and Societies are especially welcome to our friendly club. You'll enjoy our highly-rated course, quality changing rooms, excellent practice facilities, and fantastic bar and catering services. Longford Park Junior Football Club was established in September 2010 with the aim of providing children in the Chorlton, Old Trafford and Sale area access to football coaching and facilities to help improve their overall health, confidence and skill through the enjoyment of sport. In the years since, the club has grown to having 7 established teams ranging from age 6 to 12. In April 2016 Longford Park JFC started a new initiative to encourage more girls to take up football and the response has been overwhelmingly positive. The number of girls attending our weekly training sessions has increased week on week, with over 30 girls now attending. In June, only 2 months after beginning training, the girls competed in and won their first tournament, and we now have 2 teams entering in to leagues this season. An integral part of the Withington community for over 100 years, essential for the heath and well being of local people. The takeover of Withington Baths by the Love Withington Baths community group is now complete, on 20th June 2015 Withington Baths re-opened its doors a social enterprise. We believe that this small local pool, specialist in nature and design, with an enhanced gym and development of other spaces within the large Edwardian building can be an asset to Withington and wider area for many years to come, via the community-run facility scheme. Whalley Range Tennis club, located close to the centres of both Whalley Range and Chorlton, Manchester. The club is home to cricket, tennis and softball sections. The tennis section has a small but friendly membership and a fantastic mix of players of all ages, abilities and backgrounds. We have three hard courts and a fully licensed club house (which is available to both members and the public to hire). During the summer we have two mens and two ladies teams which compete in the South West Manchester Lawn Tennis League. There are also three mixed teams in a North East Cheshire Winter League. The club employs a highly experienced and qualified tennis coach. There are group coaching sessions four days a week and many members and non-members have also arranged private lessons. See the Coaching page for more information. We love to see new faces on our courts and have been fortunate to have had a great year attracting new players. If you are looking to play tennis please come down - its the perfect club for sport and making new friends. Adult social tennis - Wednesday evenings from 8pm and Sunday from 1.30pm. There will be a member from the tennis committee at social tennis every Wednesday evening throughout the summer so if you are interested in joining or finding out more about the club do come down and say hello. Chorltonians, established in 1924, provide football for people in the local community. We are fielding SIX open age teams for the 2013/2014 season, plus a youth team and a ladies team. We are officially the biggest club in the Lancashire and Cheshire Amateur League and hold the prestigious Charter Standard Award. Chorltonians have a young squad, with more than a couple of players too young to enjoy a post-match pint. This is a talented Chorltonians team, with a positive set-up and attractive style. We are a progressive cricket club, based in South Manchester. We have 5 senior mens teams, a womens team and 6 junior teams, from Under 9s to under 15s. Our 1st XI are members of the ECB Cheshire County League. The excellence of our junior development and commitment to excellent standards are recognised by the award of ClubMark by the ECB. We are also a Focus Club with Lancashire Cricket Board. We continue to invest in quality coaches at both senior and junior level to develop the playing standards of all our cricketers. We are also dedicated to improving our facilities as funding allows, and have taken significant steps during the summer with the installation of a new artificial practice wicket on the square, and the purchase of a new outfield mower. We would like to ask all members to try to contribute what you can in terms of time, commitment, ideas, practice, coaching and support as we once again look to take the club forward in 2014. If you are interested in joining our progressive and friendly club then please contact us on info@didsburycc.com. We are always on the look out for quality and committed cricketers at all levels. Our new Womens team is particularly keen to attract new recruits and as always new junior cricketers are very welcome in readiness for the start of the 2014 season. 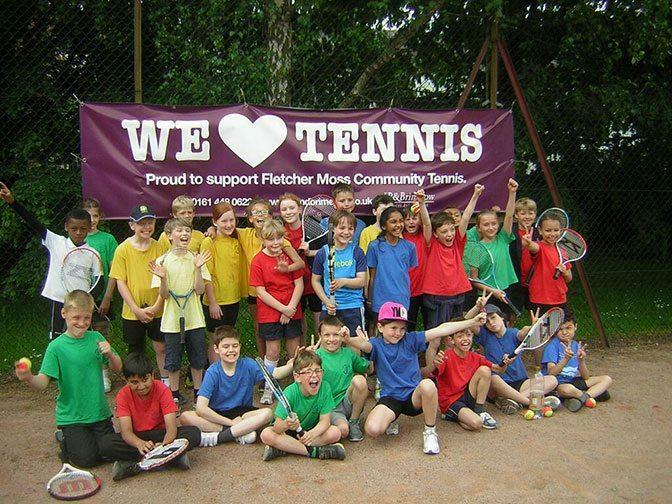 A truly welcome development recently has been the sight of tennis being played once more at Fletcher Moss. The return of tennis to the courts has been largely down to the initiative and determination of local tennis enthusiasts Chris and Suzy Keaney. Chris and Suzy are both qualified coaches and, like so many local people, have been saddened to see the lack of maintenance of the courts result in them becoming virtually unplayable. But, aided by the Friends’ group, they have managed to get the council to mark out and erect posts and nets on the shale courts, and it is now heartening to see people playing and enjoying tennis once again. Chris and Suzy have run sessions on Saturday afternoons from 2.00-4.00pm for anyone who wants to play, whatever their age or ability. At present the shale courts are having a rest until early April, as use in the winter can damage them. However the Tennis group are holding sessions on the hard courts at MMU while the shale courts are out of action; there is an over-50s group on Thursday afternoons. The club was formed in summer 1990, being the brainchild of David Brown, John Harrison, David Law, and Bill Whitten under the name North Trafford, sharing Shawe View with Trafford Borough Rugby League Club. After initially being denied entrance, a late withdrawal resulted in the club being invited to join Division 2 of the Mid-Cheshire League for 1990/91 season.